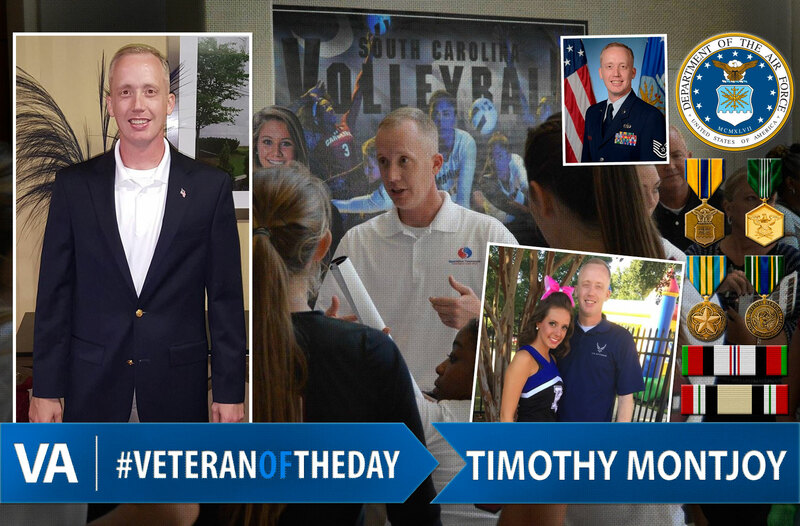 Today’s #VeteranOfTheDay is Timothy Montjoy. Timothy enlisted in the Air Force in 1996 working in Client Systems. During his career, he deployed to Turkey, Qatar, and Korea; as well as in support of Operation Iraqi Freedom and Operation Enduring Freedom. Furthermore, he is the recipient of the 2006 Communications and Information Non-Commissioned Officer of the Year award, the 2012 Air Force Sergeants Association’s, Chapter 377, Volunteer of the Year award and was selected as the 2015 Air Force Sergeants Association’s, Chapter 377, Non-Commissioned Officer of the Year. Timothy provided exceptional leadership and dedicated service to the Shaw Air Force Base military community and to well over twenty thousand families and children throughout the region. He is also the founder of Operation Teammate, which provides an opportunity for sports teams to welcome children of military and first responder parents as honorary teammates during times of separation. Timothy is a single parent and has recently relocated to Augusta, GA. He celebrated his retirement from the Air Force on November 30, 2016. Congratulations, Timothy, and thank you for your service!